The first thing one notices is the symmetry of the picture which shows that if the particle enters the top slit it will end up in the top portion of the screen, and similarly for the bottom slit. So what would happen if we only have one slit? We cannot say anything interesting in this case, but Englert, Scully, Süssmann, and Walther observed something funny: if we have both slits open and we place a type of which-way detectors in front of the slits which do not perturb the center of the mass wavefunction, the symmetry of the picture in the Bohmian description is preserved. This means that in this case in Bohmian interpretation still if the particle enters the top slit it will end up in the top portion of the screen, and similarly for the bottom slit. However, there is no interference present in this case, and because of this, there is a non-zero probability that the particle entering the top slit will be detected in the bottom part of the screen. "Does the retrodicted Böhm trajectory always agree with the observed track? Our answer is: No." "In Bohmian mechanics, a particle has a position and nothing else,..."
"...the predictive power of Bohmian mechanics does not exceed that of ordinary quantum theory, and so the alleged superiority of Bohmian mechanics over ordinary quantum theory is of a purely philosophical nature." In summary, the only advantage of dBB theory is the realism of the particle position, but there are cases where position measurements for particles contradict the dBB trajectory. The name of the paper was marketing hit, but a long term disaster: it allowed to be summarily dismissed by dBB supporters. "The authors distinguish between the Bohm trajectory for the atom and the detected path of the atom." "In this regard it would be well to bear in mind that before one can speak coherently about the path of a particle, detected or otherwise, one must have in mind a theoretical framework in terms of which this notion has some meaning." "BM provides one such framework, but it should be clear that within this framework the atom can be detected passing only through the slit through which its trajectory in fact passes. " "Thus BM, together with the authors of the paper on which we are commenting, does us the service of making it dramatically clear how very dependent upon theory is any talk of measurement or observation." "the "utter meaningless"ness of the question as to which "slit" the atom went through can, within the framework of orthodox quantum theory, in no way be avoided through the use of "one-bit detectors" - however they are called!" A modern reply to the surrealistic paper in the framework of Bohmian mechanics can be found here. Basically the take from this paper is that in their setup the second photon says that Bohm trajectories are surreal—and, thanks to nonlocality, its report is not to be trusted. I will need a bit of time to study this paper carefully, and I will follow up on this after I'll reach a definitive conclusion. Right or wrong, this paper puts the spotlight back on a forgotten dBB topic IN the framework of dBB theory. Right or wrong, this paper puts the spotlight back on a forgotten dBB topic IN the framework of dBB theory. This nicely summarizes the main dishonest thesis underlying all the activities of you, the low-brow anti-quantum activists. You just don't give a damn whether something is right or wrong - instead, you prefer the "spotlight". You're a bunch of stupid fame-searching crackpots. Science is all about the search what is right and what is wrong. When there's no way, even in principle, for any part of the information about the Bohmian trajectories to be "trusted", it is exactly the same statement as the statement that they are unphysical and an honest scientist must admit that fact and eliminate them from the list of physical concepts of his theory instead of saying that they are a big improvement or similar crap that the Bohmist Marxist dumplings love to say. Lubos, once again you comment without understanding. The recent paper is a challenge to both the surrealistic paper and the official Bohmian reply to the surrealistic paper and as such it is interesting to observe what kind of reaction it will cause. I will comment on its scientific merit once I am done studying it; I don't do knee jerk reactions like you do. If you want me on record about the validity of the surrealistic paper and the original reply, the surrealistic paper is correct, and the reply is wrong: a misdirection as I highlighted in color in the text. Now did you write anything about surrealistic paper until now? I do not recall any blog post of yours about it. Did you read the surrealistic paper before reading it here? I did write an actual analysis of ESSW and the reply, and not just a superficial statement like you, and 10 days before you. Be sure that you're retarded. Google search for "Anti-quantum zealots have deduced exactly the opposite conclusion again" if you dared to have missed my essay. I see. So you did. What can I say? Even a blind squirrel finds a nut here and there. I missed that in the flood of nonsense supporting Putin, Trump, religious bigots, and climate change deniers. If you only want to have a chance to understand 1% of the quantum mechanics wisdom that I understand while you want to remain the same imbecile when it comes to politics, climate, and many other issues, you may simply bookmark the quantum foundations category. there is so much debate about the double slit experiment. One should simply watch how the oil drop travels through one slit and the waves pass through both slits altering the drop's path. I see that Lubos endorses on his blog an "interaction-free" nonsense clip. The guys didn't learn about the fact that particles interact from a distance by means of local fields like electric field or magnetic field or gravitational field. While it is true that photons do not significantly interact with these fields the electrons and nuclei at the slits do, so the photon's path can change. Still the same obsession with the billiard-balls/bullets model. But it gets even weirder. 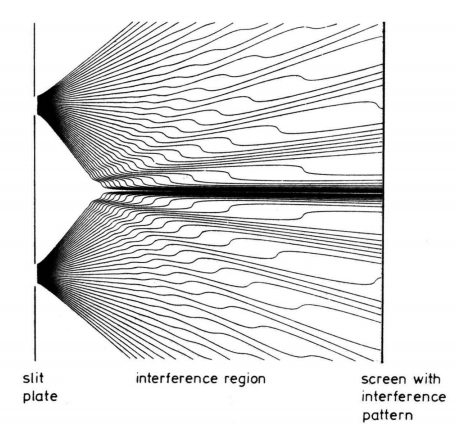 Lubos thinks that it is not the interaction between the incoming particle with the slits/detectors that determines the pattern on the screen but the observer's knowledge. In the same way creationists see God's hand everywhere, Lubos sees observers. The fact that the quantum formalism doesn't say anything obout the observers but only about the observed system doesn't deter him. The point of the surrealistic paper is that while Bohmian mechanics predicts particle paths, some of them have no correspondence in reality. It's like saying a person traveled by train from DC to NY, while he got a speeding ticket in Los Angeles. Yves Couder is very careful to void equating his experiment with QM. Now here is a question for you: if everything is classical, how do you explain superconductivity? You cannot suspect me of agreeing with Lubos when he is not right. In the case of interaction-free collapse he is right. See https://en.wikipedia.org/wiki/Elitzur%E2%80%93Vaidman_bomb_tester I should probably talk about it next time. "A supporter of Bohmian mechanics woulds insist that the atom went along its Bohm trajectory through one of the detectors, but left its mark in the other one. Thus, he concludes, the which-way detectors do not deserve their name." The real quantum field acts at the place of the detector even if the particle is not there. What is the problem? I don't think the paper actually presents an argument. No inconsistency of the theory either theoretical or with experiment has been revealed. I do not like Bohm's theory for reasons I have mentioned earlier on this blog, but it is still superior to the observer-centered view Lubos likes. On the other hand I think the original Copenhagen view as presented by Bohr is better than the Bohmian one. Of course, if Bohm's theory is indeed incompatible with relativity (I don't know if a rigorous proof exists) the theory is dead. I remember reading a paper presenting a relativistic version of Bohm's theory but the price was that the particles' paths were different in different frames of references. If this is true there is not much realism left. So, while the research is in progress we can safely conclude that both non-locality, as proposed by Bohm and non-realism are in the same situation as creationists after Darwin. Why do you believe that superconductivity cannot be described by a classical theory? Let's analyze the so-called "interaction-free" bomb test. 1. The true bomb is capable of absorbing the photon, while the false bomb is not. This implies that the charge distribution (electrons and nuclei) of the true bomb is different than the charge distribution of the false bomb. 2. The charge distribution associated with a true bomb, beyond blocking the photon's path, determines an electric and magnetic field that acts on the whole experimental setup. 3. The reason for the change in the photon's path in the case of a true bomb (even if the photon takes the other route) is the fact that the associated electric and magnetic fields produce a displacement in the position/momenta of the elctrons/nuclei present in the interferometer. 4. I have therefore shown that an interaction is always present. It is the electromagnetic interaction between the electrons/nuclei in the bomb and the electrons/nuclei in the interferometer. The same reasoning applies in the case of the "interaction free" double-slit experiment on Lubos' blog. As I have said earlier, his line of reasoning is based on the ridiculous billiard-balls model. If the particles do not bump into each other the do not interact. Playing with some magnets may help letting that model go. In conclusion you have chosen a wrong example to agree with Lubos. I suggest you trust him on the global-warming issue though. Andrei, please read my next post; I will explain it there. On the superconductivity topic, in a regular wire, what is the mechanism which causes the resistance to change with temperature? Can you find such a mechanism which would make the resistance suddenly drop to zero? I cannot provide a different explanation of superconductivity than the quantum one, involving Cooper pairs. To be clear, I do not claim that the statistical quantum mechanical description is wrong. It is true, but it doesn't mean that it is not based on a classical mechanism. Now imagine a person who must choose between going through one of two possible doors. The reality is that person goes through either door one or door two and there is no classical meaning for the person going through a superposition of the two doors. Before choosing a door, there is a neural superposition state that entangles both possible futures. That state exists for some short coherence time until choosing one door or the other, whereupon the neural superposition state collapses into a memory of the entanglement of two possible futures. It is the memory of that neural superposition state, the state where either future is still possible, that we call free will. Now imagine two people choosing between two doors, either the same or the other door. The further entanglement of neural states means that a choice of a door may be either compassionate or selfish depending on the bonding relationship between the two people. Once again, both people make a choice and remember the entanglement of their choices as free will. Accordingly, the two people in a bonding relationship have chosen with their free will to be either compassionate or selfish and these quantum futures are not certain. It all boils down to what a superposition state means. I see no particular reason to see it as anything else than a statistical tool to deal with the incomplete knowledge of the system. A "true" superposition requires either non-locality or a denial of the experimental results. The first choice conflicts with relativity, while the second one amounts to an abandonment of science. I don't quite get your points. Particles are not people. The paper is also available on arxiv. They manage to derive quantitative results for various experiments, involving more than two slits, and all without any quantum formalism. See my next post. Can classical physics do this?